Yellow sticky tape on a roll is used to trap flying insects including horse chestnut leaf miner. 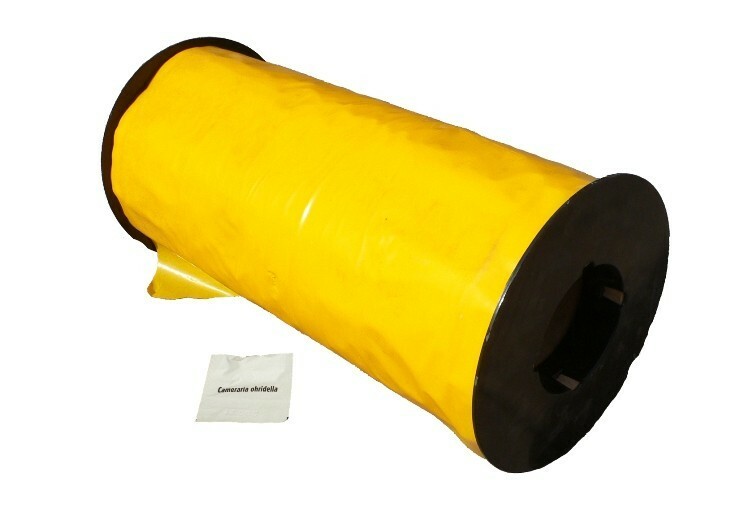 Sticky rolls coated with pressure sensitive dry or wet adhesive. They are made of high quality polypropylene material. Glue rolls are specially designed for capturing insects by eliciting a response to a specific colour matrix. As a result of attraction the insect lands on the sticky surface thus unable to escape. It is a UV and sprinkler irrigation resistant roll with an efficacy for a period of 8-12 weeks. Sticky rolls should be applied before the emergence of the first generation of infested insect and until the end of the season. Insects are attracted to specific colour wave lengths. The colour stimuli elicit response from insect. For identification of host, mating place and finding oviposition sites. For white fly and Aphids yellow colour roll and for Thrips blue colour roll has been proven to be a very effective attractant. Store in a cool, dry and well ventilated room.